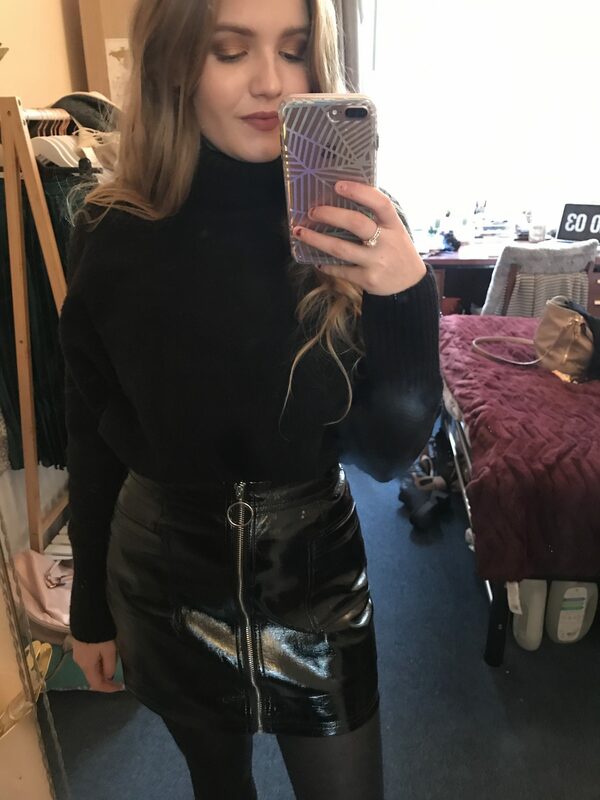 Happy Monday people, today for Blogmas I thought I’d share with you a week in outfits. I’ve done one of these before but you my remember it was mostly jeans and a jumper as I’m not very adventurous. So this time I thought I’d attempt a no jeans edition- no jeans for a whole week!! Anyone that knows me will be aware I live in my jeans and comfy knitwear so this was sure to be a task and I managed to pick the coldest week of the year so far to attempt this little fashion challenge. However in an attempt to be adventurous I’ve accidentally worn the same style a-line skirt all week instead of denim so I don’t know if that is much better? 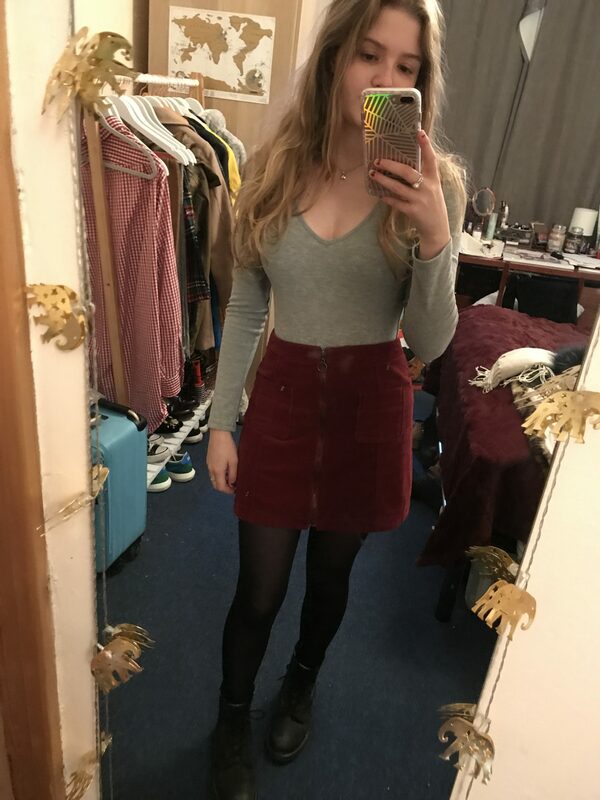 So onto the actual outfits, on Tuesday I headed into Uni for a few hours and then did work at home for the rest of the day so I just opted for something warm and comfy. 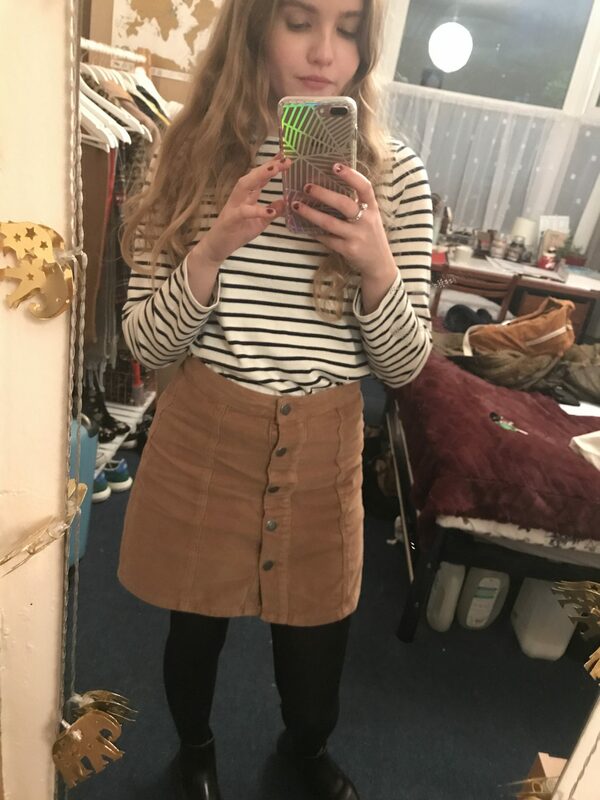 This Joules striped t-shirt is super warm as it’s a thicker material and I nabbed the Primark skirt from my sister when she no longer wanted it. Then I just paired them with my Dr Martens Flora Chelsea Boots as it was super chilly. Wednesday didn’t count as I went to work wearing my uniform and then didn’t take it off until I got in my Pyjamas later on. So instead I’ll skip to Thursday, please excuse my dirty mirror! On Thursday I did some volunteering at the Millennium Galleries in Sheffield before attending a blogger event at the new Joe Browns store in Meadowhall, if you want to hear more about that check out Blogmas Day 1! For the event I wore my Marks & Spencer Black Jumper tucked into an old Hollister Suede Skirt. To make the outfit a bit more exciting I wore my Topshop embroidered boots which everybody seemed to like! On Friday I was feeling super festive as it was the 1st of December, although I don’t look very awake on this photo! 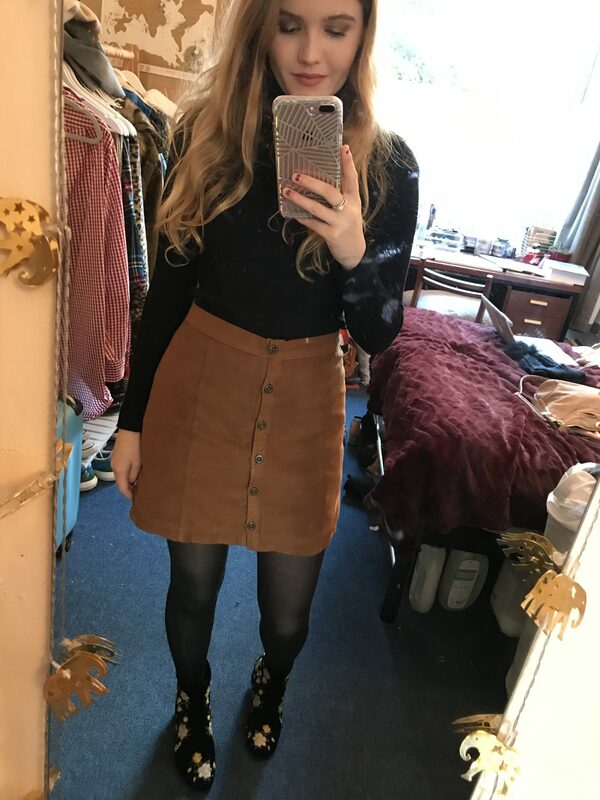 I wore my Grey Misguided bodysuit tucked into my Hollister, cord, burgundy skirt and as the temperature dropped even colder I went with my fur lined Serena Dr Martens boots! This was the day where me Amy and Abi took a trip to Ikea, where I accidentally bought non-alcoholic mulled wine and then to Meadowhall for a spot of Christmas shopping. Again, Saturday didn’t count as I was at work in my Uniform so onto Sunday! 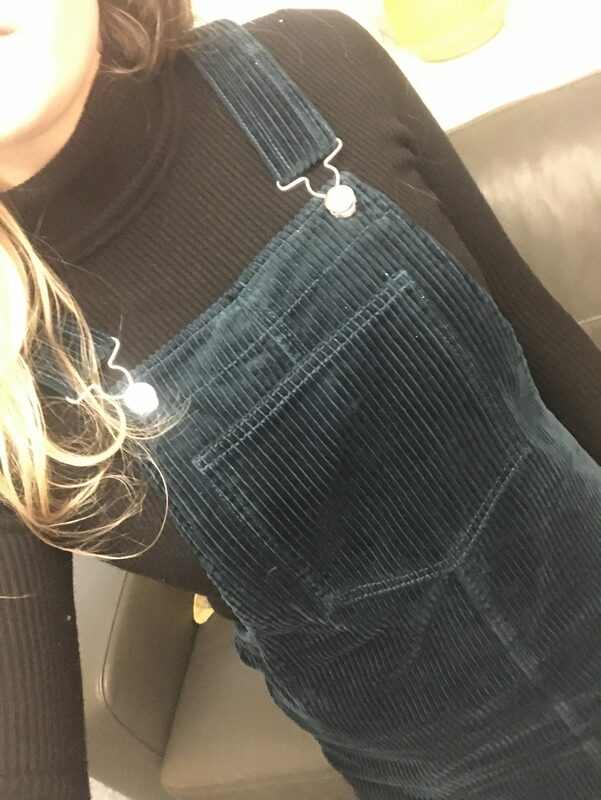 I wore my new Mango Teal Pinafore Dress over my M&S jumper again (I really love it!). We spent a lazy morning eating bacon sandwiches before heading home to help trim the house up and decorate the Christmas trees! It was another super festive day listening to Mariah belt out a Christmas classic whilst stuffing our faces with Heroes and Quality Street. Now we’re bang up to date with today! In an hour or so I will be heading to York with Amy, Abi and Danielle for shopping and food on our annual trip round the Shambles. It’s slightly warmer than it has been but I’m still not deviating away from jumpers just yet. Today I’ve gone for my & Other Stories Roll Neck Jumper that I mentioned in my Winter Capsule Wardrobe post– it is like a blanket just saying! Alongside this I’ve gone for my Topshop Vinyl Skirt for a different texture to break up all the black and then my trusty Dr Martens as I know they are comfy enough to walk around in all day. So there we have it, a week (ish) in outfits, sorry there’s not an outfit for everyday but trust me, my uniform is boring. I hope this has given you a bit of an insight into what I’ve been getting up to and offered you a bit of winter style inspiration other than the classic pair of black jeans which I am usually sporting. Let me know in the comments if you like this kind of post or not and thanks for reading!